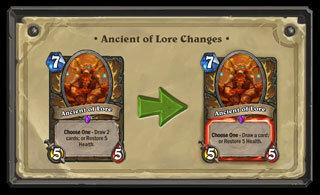 The Whispers of the Old Gods expansion patch will bring some significant nerfs to certain existing Hearthstone cards. Whenever Blizzard releases a patch to any of their games, you can bet that there will be some balance changes included in it. Next week's Whispers of the Old Gods expansion is no exception, as it will feature a number of nerfs to oft-used cards in the Basic and Classic sets. "New card releases should have an impact on Standard and enrich Wild, to make sure that Hearthstone is always as dynamic, fresh, and fun as it can be."